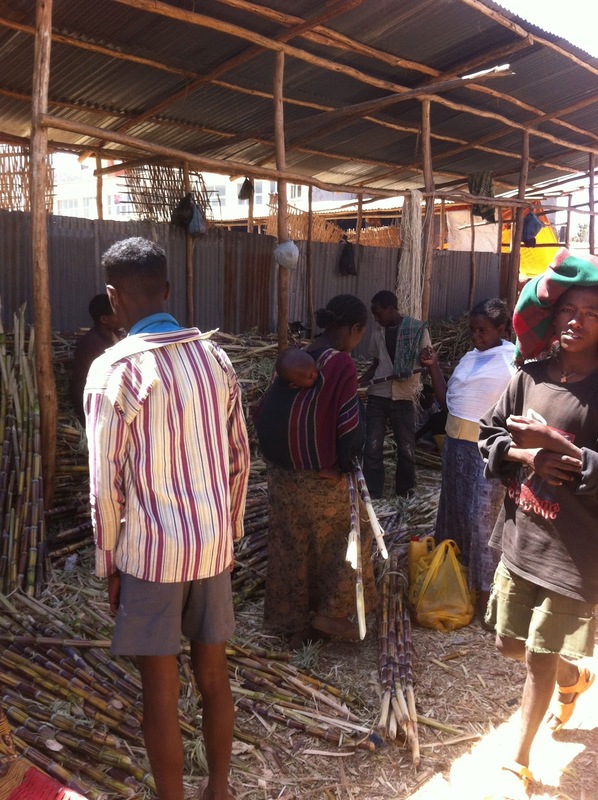 The Merkato, or open air market, in Addis Ababa is supposedly the largest in Africa. 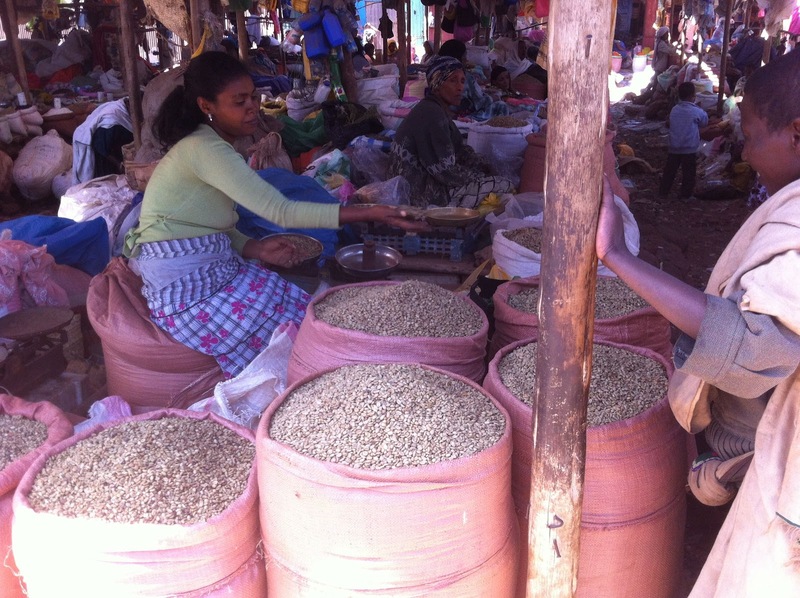 The first couple of pictures are from the market in Bahir Dar, a city 1/20th the size of the capital. It seemed plenty large to me and I felt pretty overwhelmed. 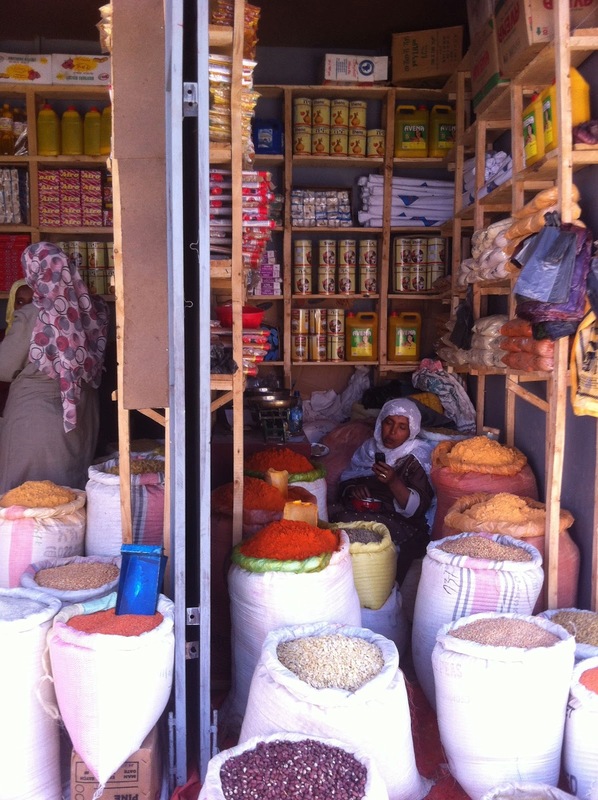 There was a large covered area near the center with a lot of people selling grain, rice, pasta, coffee and spices. Surrounding this were smaller vendors selling charcoal, wood, pots, utensils, tools, hardware, and you-name-it. If you really wanted something "special" then you probably wouldn't be able to find it but it was probably there somewhere. 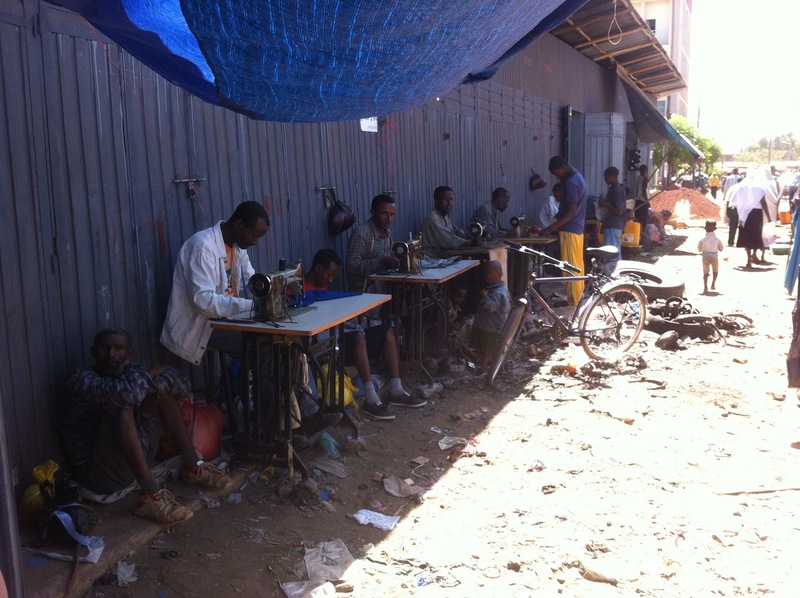 There was a line of men operating treadle sewing machines and I'm guessing that this is where you brought things to be mended. After all, every household couldn't afford their own sewing machine. All of the machines were old Singer branded machines. I believe that the original tooling was shipped to South America and new treadle machines are still being manufactured under a different name, these are all the older originals. Pretty cool that they are still being used and still working. This is a spice vendor. These little closet sized shops are lining alleys barely wide enough to walk through. And there was usually a deep gutter in the middle to deal with the torrential rains that come every afternoon in the rainy season. Many of these small shops also sold imported goods such as candy and packaged food. I looked for some locally made candy to bring back but there wasn't anything odd. Just some hard candy that tasted like blocks of sugar. One thing I haven't mentioned yet is that all transactions are done with cash. No plastic accepted anywhere except places like the Hilton and Sheraton. All of the shops deal only in cash and some were even prepared to deal in dollars. The air in this area of the market was heavy with the smell of the different spices and it was somewhat overpowering after a while. I was looking for green cardamom but everyones eyes were burning from the spices floating in the air. 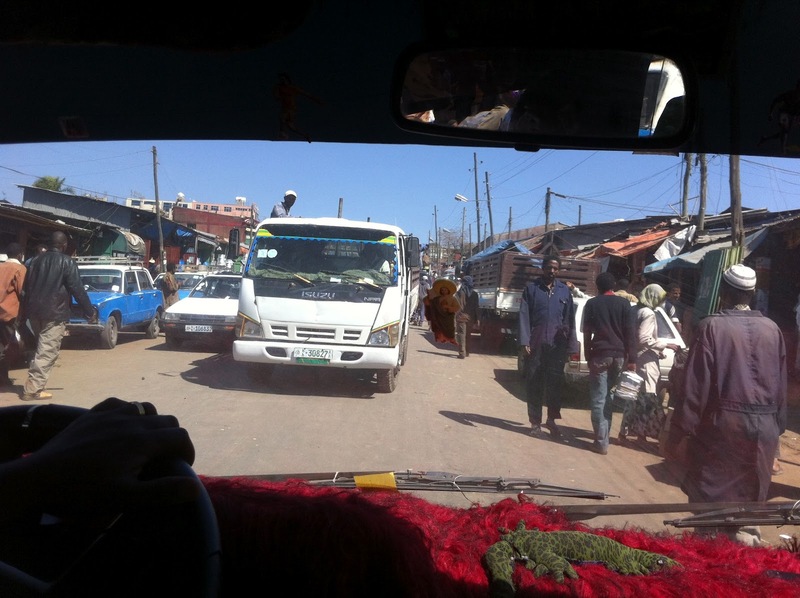 We got around to the different areas of the market in a chartered mini-bus. This picture and the next may give some indication of the traffic you would need to deal with on your weekly grocery run. Boy, I feel so spoiled being able to run to the local grocery or hardware store to find the things we need. This is in the hardware section of the market and we were looking for something resembling dry wall screw. All screws were slotted, no phillips flat head screws were seen at any of the vendors. There was quite a bit of hand made hardware such as hinges and latches which I would have liked to bring back but that stuff tends to be pretty heavy. The blue and white mini-buses were everywhere we went and seem to be the most popular type of public transportation. Some called them weits but I couldn't find an Internet reference for that word. We were told that weit referred to a different type of shared ride vehicle that has pretty much been phased out. They were small pickup trucks with benches on both sides of the bed. There was someone who communicated with the driver calling out stops and yelling at pedestrians letting them know where they were headed. In the mini-bus, that person is standing by the sliding door performing the same function. Running a mini-bus is a hard way to make a living with the current price of diesel fuel. 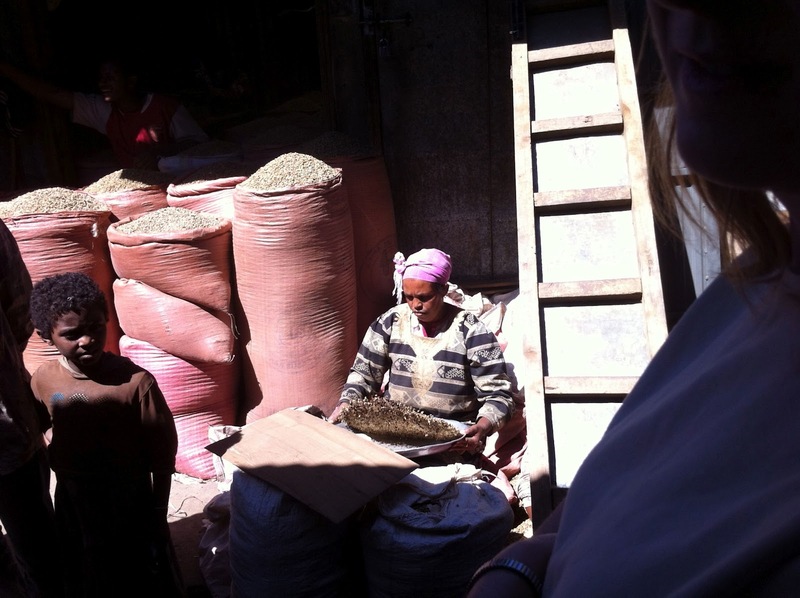 This last photo is of a woman tossing coffee beans to get rid of any small stones that may have been picked up as part of the drying process. As I mentioned before, most of the coffee is sold unroasted. The only roasted coffee was sold pre-ground in bags in the tourist gift shops. Our hosts recommended not buying these packages as we wouldn't know where the beans were grown nor who did the roasting. And I thought that folks around here were coffee purists. We followed their advice though I have yet to try any of the beans I brought back. The open air market looks really neat. I could see how the spices might get to you after a while. Being that fresh the smell would have been incredible. The mini-bus was pretty interesting. An extra row of seats is usually squeezed in as well as all of the other customizations such that, including the driver, the mini-bus holds 12 passengers. All of them are diesel and have column shifted manual transmissions. And most have surprisingly little body damage. I'm glad someone else was driving. how hot was it there ? I notice everyone covered up, mostly heavier weight shirts. seeing that you only use cash, are their pick-pockets, or did you feel safe with your money ? How about photos ? do you have to sneak them or can you obviously click away, I'd imagine they don't get much tourism here. are there many other "travellers" here, other than yourselves ? It was pretty warm. In the middle of the day, it was regularly 32°C (90°F). No one wore shorts except some of the tourists at the fancy hotels. Most men wore slacks and long sleeve shirts unless they were doing construction work and wore t-shirts and most of the women wore long skirts. We knew this ahead of time and dressed to match the culture. Jeans aren't common as they are expensive. There is a thriving tourism industry and we saw a number of other tourists there including a number from the U.S. and Canada. As far as money, we were told to use those travel pouches commonly sold to hold your passport. All I brought was one credit card to use in the airports enroute, my passport, health card, and a modest amount of cash which we could exchange at the bank as needed. 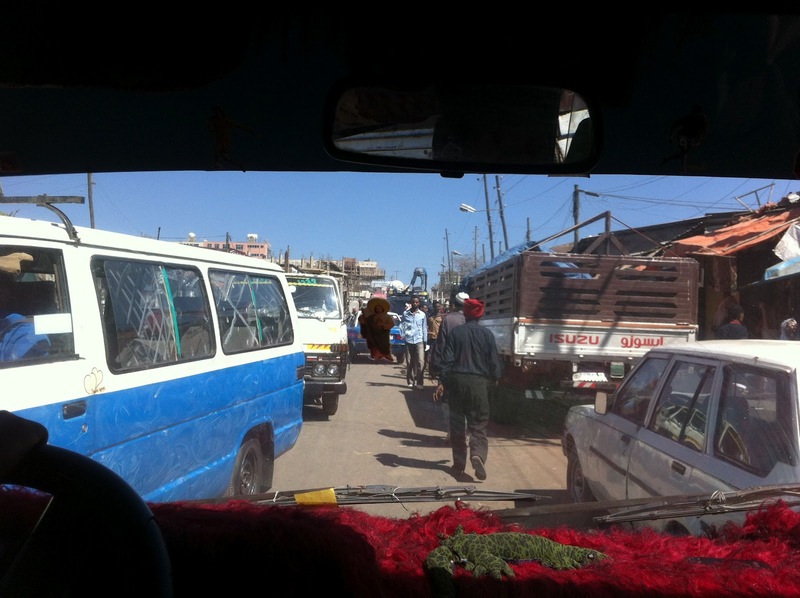 In really crowded areas such as the Merkato, we were told that pick pockets may be a problem. I didn't carry the DSLR on the days we went to the market. All of these pictures are iPhone snapshots. We take so many things for granted in North America. I am not sure I could deal with the crowding, I tend to like my space, I think this comes from being a rider. It must have been so interesting seeing a different culture and how people live everyday. I don't like crowds either but you just adapt. The traffic would take some getting used to though. Merkato, was the country a colony of perhaps a European power at one time? I ask because Merkato is close to Mercado, which is Spanish for market as you probably know....seemed close enough. Chewing on sugar cane, I just to do that as a kid growing up in Honduras, that was a great sweet snack. Thanks for reminding me of that. I'm not really sure of the spelling either. I saw it spelled this way at least once. Amharic uses a different alphabet so any spelling using the roman or latin alphabet is an approximation. My grandmother used to sew on a treadle machine. I'm pretty sure my mom still has it. (She has a serious collection of antiques). That is cool to see them still in use. The open air market photos are fantastic. Really shows the community. Funny about the coffee beans...who'da thunk? Thirty years ago, while shopping for a sewing machine, I ran into some brand new treadle machines for sale. I think that they were made in Brazil using the original Singer tooling. They worked great but weren't very portable. I can almost hear the buzz at the market place. Such a different pace and way of life than we have here. The treadle sewing machine speaks volumes. The market place wasn't noisy but there was a constant sound of talking, kids and vehicles. A very busy place and everyone trying to sell you something. Kids seemed to follow us around and some try out their English on us. A few ask for money but it wasn't like we were being constantly asked.